Instead of adding a little Grand Mariner to your coffee, why not indulge in the flavor itself? This Grand Mariner flavored coffee will hit the spot for anyone that loves this orange-infused, rich alcoholic treat. 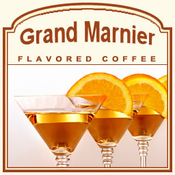 Perfect for an after-dinner dessert, the Grand Mariner flavored coffee will melt your taste buds with its wine-like qualities and full-bodied flavor from its 100% authentic Arabica beans. With only 2 calories in each cup, you can indulge in this luxurious Grand Mariner flavored coffee guilt-free. Roasted and shipped on the same day, the Grand Mariner flavored coffee is an exceptionally rich coffee with a royal impress. Packaged in a heat-sealed valve bag, this Grand Mariner coffee will be fresh and high in quality, offering the classic Grand Mariner taste you crave!